El Conquistador Resort Tucson – The Hilton Resort Golf course provides spectacular mountain views. Nestled on the foothills of the breathtaking Santa Catalina Mountains. El Conquistador Tucson Resort and golf course sits on 500 acres of Sonoran Desert terrain. El Conquistador Resort Tucson golf course surrounds the Hilton Resort. The nine-hole Pusch Ridge Course winds, dips and climbs through 175 feet of vertical drop. At 2,788-yards, the Par 35 course is short. Sloping fairways and greens make it an interesting experience. Two other courses Conquistador and Cañada are about a mile away. Both courses offer traditional layouts in spectacular settings. Patio & Single Family Homes surround the 9 hole Hilton Resort course. Homes provide a quiet resort setting for their owners. A popular winter residence with all the amenities of the resort and Town of Oro Valley. Located near the Hilton El Conquistador Resort Tucson home owners can walk to lunch or dinner. Residents enjoy the resort lifestyle. El Conquistador Resort Tucson Patio Homes were built in the mid 80’s to mid 90’s. Most homes have views of the golf course or mountains. Residents are also only minutes away from Oro Valley shopping, restaurants and many other amenities. 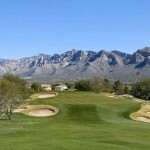 Oro Valley Country is also nearby for those interested in a members only golf club. The Club has a state-of-the-art fitness center, full service pro shop and an active social calendar. Members enjoy many fine dining along with some of the best views in Oro Valley.